Click on the arrow on the far right to go to the next episode. Find out about traditional Hanukkah activities, such as lighting candles and the dreidel spinning top game. Hanukkah is also spelled as "Chanukah". Print out a template to get started. Make a paper dreidel, cut-out stars or a Hanukkah greeting card. Click on the button next to a topic. 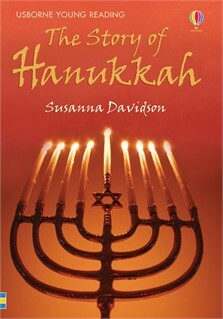 A retelling of the story of Hanukkah for children growing in reading confidence. Tells the story of the Jewish festival of lights, from its beginnings in Ancient Israel to how modern day Jewish families keep the traditions and ceremonies alive. Part of the Usborne Reading Programme developed with reading experts at the University of Reading. I knew nothing about Hanukkah but now I know. It is a good book and it gave me information about Jews and their religion. So if you are interested in religion then you should read it😉. I knew nothing about Hanukkah, but this book has told me everything!I love the recipes and games. All those interested in festivals should read this book.